There's an interesting article in the October issue of More magazine called "Don't Mind the Gap". If your entourage doesn't include any Gen Xers or seniors, why not? Some of the best relationships skip a generation. It's about the benefits of having friends who are younger and older than you, rather than just your age. Your younger friends keep you young and give you a spark. Your older friends can share their experience and wisdom with you. 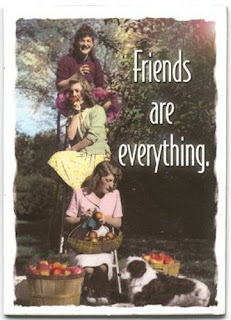 I'm lucky in that I have lots of great friends of different ages. My youngest friend is probably Yvette, who is 32ish. She's a fitness trainer and a a Master in the Art and Science of NLP (Neuro Linguistic Programming). I met her in the summer of 2004 when she became my trainer and boxing instructor. My oldest friend is probably Deb, who is 54ish. Deb and I worked together in 1995 and have stayed tight since. She and I are part of the Chillin' Chicks. Who are your youngest and oldest friends? Sue was lamenting last week about stores and restaurants being closed to build more condos. We noticed last week that the Famous PEOPLE Players building is fenced up, getting ready to be knocked down for condos? I took KC for a walk this afternoon to check it out. Famous PEOPLE Players have relocated to Etobicoke. KC and I rounded the corner and headed towards Queen Street W. There are a couple other buildings fenced up, ready to go ... on the east side. ... and on the west side (this building has been closed up as long as I've lived in the 'hood). BTW, here is the parking lot where Gord and I enjoyed the Havana Cultura Festival on Saturday night. It's back to normal today. When I logged onto my blog yesterday morning, it didn't point to my blog ... it pointed to some odd site. I use Blogger and bought my URL from them last year. It's only $10 a year and they take care of everything (registering, etc.). I searched their site to see what I should do. I couldn't find a contact on their site to asked about it so I posted my query on their forum. Your problem is in the DNS addresses. Please read the cited articles for details. I'll show excerpted Dig logs, here. www.purple4mee.com. 1800 IN CNAME ghs.google.com. Did you get email from Google Apps, when you paid for the custom URL? I'm sure I could figure out how to fix it ... except that because Blogger set it up, I can't get at the DNS address. So I responded back to the forum but haven't heard anything more. Can someone pleez help me?! 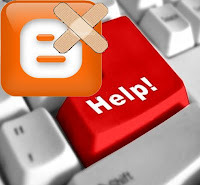 In the meantime, I've switched back to the Blogspot address. From Amazon.com ~ When a benign trip to Bermuda with his significant other is upset by a brutal murder, and some financial jiggery-pokery robs him of $2 million from a Bermuda bank account, former Miami Dolphins linebacker Zack Chasteen blitzes. 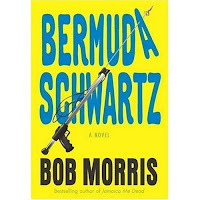 He's quickly up to his keister in violent local thugs, the search for sunken treasure, Bermudan police and his own machinations to recover his two mil. Morris' third Zack novel is amiable, engaging and brisk, and Zack's direct approach to problem solving is a pleasant change of pace from so many of today's conflicted and complex fictional knights errant. But some readers may feel they've been shorted on character development, and others will miss a strong sense of place. This is the third in the Zack Chasteen series. I enjoyed the first two (though I'd read them out of order). This one was okay, not as good as the first two. I found that it got bogged down with too many details of the history of the sunken treasure. And there seemed to be so many characters to keep track of (no doubt to throw the reader off). I wasn't enthused about the one who dunnit ... and less excited about the quick wrap up at the end. It wasn't necessary. The Havana Cultura Festival is in our 'hood this weekend. It is sponsored by Havana Club. We stopped in at the Outdoor Extravaganza which took over a parking lot. There were a couple food vendors and you could buy Cuba Libres and Mojitos made with Havana Club rum. It got chilly and rainy so we went home to get our jackets. There was good entertainment ... jazz, classical, soul, rap and rock. We were soaked but everyone stayed and had fun! After the movie, we saw that there were New York cabs and police cars outside the theatre next to Much Music. Apparently they were filming a Degrassi and Toronto was standing in for New York. It's an annual tradition for the Girls Night Out Club to go to the Hard Rock Cafe at the Rogers Centre in September to watch a ball game. The Hard Rock Cafe is closing on Sunday so this was our last opportunity to do that. Here we are ... Jenn, Jen, Darlene, me and Gord. Angie has pneumonia so couldn't make it. Here's the view from our table. Another tradition has been to have a Liquid Cocaine (Goldschlager cinnamon schnapps and Jagermeister). Darlene called Angie just before we drank 'em. Jen ordered a brownie sundae instead of a Liquid Cocaine. Though the service was extremely slow, we had fun! 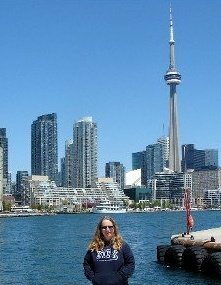 The Toronto Blue Jays beat the Seattle Mariners 5 - 0 ... yay! Today was a full day at the sale conference. The group was split with each doing their own thing. I was part of the Education Advisors/Account Managers group (the other group was the sales people). Our morning was spent talking about the departments and some restructuring. The afternoon was spent in a seminar called Healing Client Relationships. It was a good day! Lunch was salmon ... I don't eat salmon so they did a steak for me. Supper was capon ... tastes like chicken! After supper, we went back to Ray's Bistro Bakery for some drinks. Tonight there was a fella singing who was pretty good. Like last night, we were the only ones there. We all had supper together. Chia Kitty went right for the red wine! On the menu was lamb ... lamb?! I don't eat lamb so the staff was kind enough to do a fillet mignon for me, which was good. My manager, Karrina, took a liking to Chia Kitty. It was Margo's (my manager's manager) birthday ... and they surprised her with a cake. Notice how Chia Kitty is right there with the cake?! Neil, who is part of our Toronto team, was awarded Account Manager of the Year. Yay, Neil! Then we walked to Ray's Bistro Bakery (about 15 minutes) for some drinks. Can I take a kitty to a sales conference? Whole lotta hackin' goin' on!